In a recent investigation, Vice News looked into the increased aliyah of French Jewry, and the Israeli government's efforts to make sure that this wave continues well into the future. Of particular interest was the answer Natan Sharansky, the chairman of the Jewish Agency and the man largely responsible for overseeing aliyah, gave when challenged as to the preposterous notion that Israel is somehow safer than Paris. Sharansky conceded that Israel is not safer than Paris in a physical sense, but said rather, that aliyah is about feeling secure and feeling at home. There have been times, too many times, throughout history that we Jews were expelled from or killed in our home countries. In these situations we always had faith that G-d would provide us with refuge somewhere. And this was in fact the case. When one door closed, another door, thank G-d, opened. The Jewish people have always been able to find safe haven in the many kind and generous countries throughout the world. Nowadays especially, the Jewish people have experienced unprecedented acceptance and safety throughout the world, and for this, we are so grateful. That is why it is so odd that Jews would feel the need to leave France, especially when President Francois Hollande has made statements such as, “You, French people of the Jewish faith, your place is here, in your home. France is your country.” And Prime Minister Manuel Valls, in response to Benjamin Netanyahu’s urging of French Jews to make aliyah, said, “The place for French Jews is France.” It’s not just that we assume Jews to be welcome in France, but rather, French leaders are explicitly stating they want Jews in France! This should be a cause for celebration and appreciation, not fear and emigration. What is the supposed rationale behind the Zionist effort encouraging French aliyah? In the Vice story, Sharansky and other Israeli officials made reference to a “new anti-Semitism,” the immigration to Europe of millions of Muslims, and in particular, the significant number of radicalized Muslim immigrants. If the presence of Muslims is really the cause for concern and impetus for aliyah, Israel sure is a strange choice of destination. The population of Israel is over 20% Muslim, and well, there are a few Muslims in the West Bank, Gaza, East Jerusalem, and the rest of the Middle East as well. Furthermore, Netanyahu has spoken numerous times of the Iranian threat. Taking Bibi at his word, he is genuinely concerned that Iran, whether on its own or via proxy, will attempt to wipe Israel off the map. It’s hard to understand how French immigrants could have a feeling of security in such a hostile environment. While there have been tragic terrorist attacks in France, no one is claiming that France is under the threat of annihilation! Israel, on the other hand, as its leaders have so frequently stated, resides in a very dangerous neighborhood. 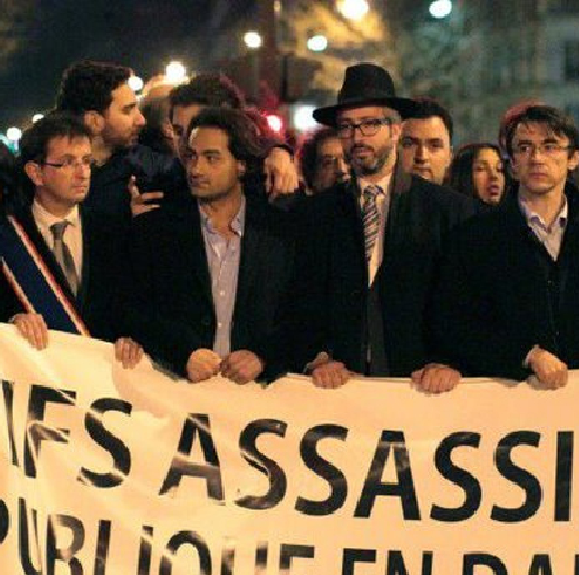 It’s time for French Jews to give up the fantasy and face the reality. France is a well respected global power, both militarily and economically, and its leaders are committed to the safety and wellbeing of its Jewish citizens. Israel on the other hand, is a global pariah. Even in the United States, Israel’s strongest ally, support is waning. At college campuses around the USA, the voices of frustration can be heard. Support of Israel is no longer a sure thing among American Jewish youth. Israel desires French aliyah, not to offer protection, but to try and continue to change the demographics, particularly in the West Bank. This is a most unpopular initiative, and the world is becoming ever more frustrated with Israel’s game of cat and mouse. An increase in aliyah, especially to the West Bank, will only help to fuel anti-Semitism. French Jews would be wise not to allow themselves to be Israel’s pawns, and instead, embrace their country that loves them. As the prophet Jeremiah (29:7) instructed us, be loyal citizens of your country and pray for its welfare, for through its welfare will you have welfare.